NEW YORK--(BUSINESS WIRE)--Business Wire on Monday announced the launch of its Interactive Media service which transforms how news is delivered and consumed. The service breathes new life into traditional news release content with multimedia and dynamic updates as the news evolves. 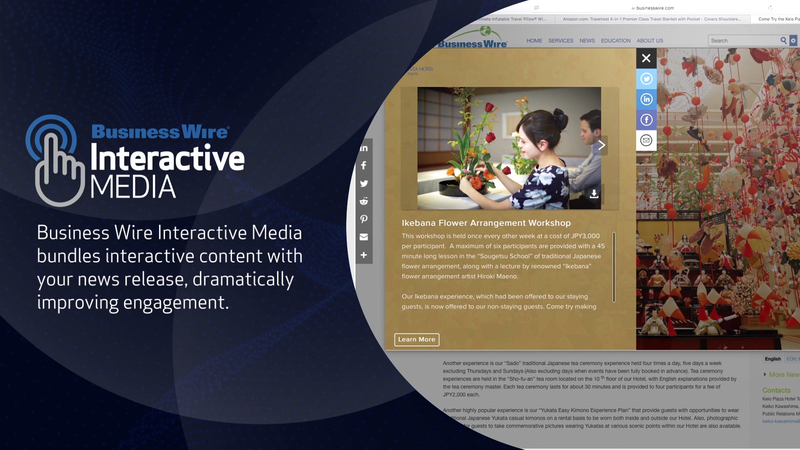 Business Wire’s Interactive Media is the only service that moves beyond a flat press release to create multidimensional StorySets™. A StorySet starts with a written press release and augments it with visual assets such as customer video clips, data-rich infographics and photos. Customers can update StorySet content as news evolves, extending the life and long-term engagement of the news event. The result is an interactive experience with multimedia and clickable hotspots that travel with the news release. The StorySet can include hyperlinks to social channels for deeper engagement and sharing, as well as links to corporate or ecommerce sites to drive traffic, engagement or conversions. Clients can track performance metrics such as engagement and message adoption to prove business impact and use the insights to optimize story updates. Metrics and engagement can be tracked by hotspot, length, frequency and device. Learn more at http://pr.businesswire.com/interactive and follow updates on Twitter: @businesswire or on Facebook. Business Wire on Monday announced the launch of its Interactive Media service which transforms how news is delivered and consumed.